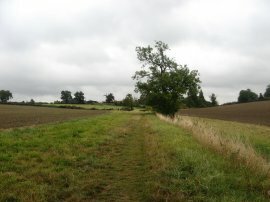 I did the first stage of my walk along the Harcamlow Way on Tuesday 6th October 2009. I drove to Sawbridgeworth from where I took the train down to Roydon for the start of the walk. 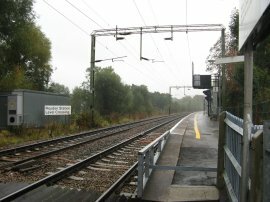 In between getting on the train at Sawbridgeworth and arriving at Roydon the heavens had opened at the first thing I had to do upon leaving Roydon Station, photo 1, was to stand under a tree and put my waterproofs on, the station itself not having any shelter. Roydon Station is on the route of the Harcamlow Way, and once suitably dressed I had a short wait for a train to pass before heading back over the level crossing and on to the towpath of the River Stort Navigation, photo 2, which is immediately besides the station. 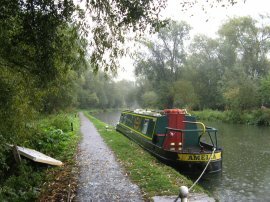 This towpath, photo 3, is then followed all the way up to the A1184 by Harlow Mill along a stretch of footpath I know quite well, having also walked it as part of the Three Forests Way, the Stort Valley Way and also my walk along the River Stort Navigation. The rain was very heavy and I did pause for a while and consider whether to do the walk however in the end I thought, with the winter months approaching, it would be a good test of my waterproofs. Not far after I had started the walk I passed a wasps nest on the bank of the canal that had been partially uncovered where there was a big mass of wasps swarming over the remain of the nest. I was surprised they had built their nest so close to the waters edge and also wondered what had partially uncovered it. I did try taking a photo but in trying to protect my camera from the damp weather it just came out as a blur. 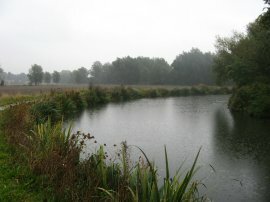 The route follows the river upstream past Roydon Lock and heads towards the Hunsdon Mead Nature Reserve, photo 4, which is managed by the Herts and Middlesex Wildlife Trust. 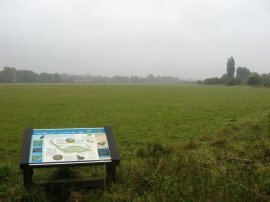 According to a sign the 67 acre site is "one of the finest hay meadows in Britain and one of the few places still operating the ancient Lammas System." 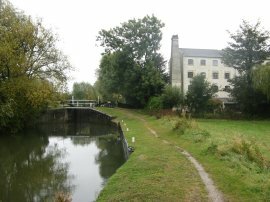 The route runs alongside the nature reserve up to Hunsdon Lock and follows the towpath on to Parndon Lock and the artists studios of Parndon Mill, photo 5. The metal and glass bridge over the flood relief channel at Parndon Lock, which forms part of the River Stort Sculpture trail and was under construction when I had walked here last year, was now complete and open for use. 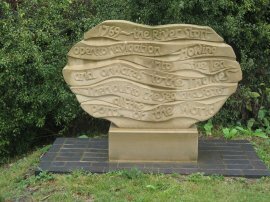 Along with the bridge, known as "Over the Weir" there is a further piece of sculpture at each of the four locks in Harlow including "Flowing Onwards" by Angela Godfrey at the Parndon Lock, photo 6. 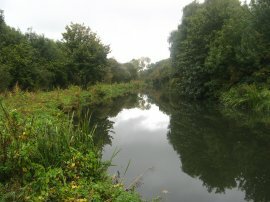 From Parndon Lock it is only a short walk up the river to Burnt Mill Lock on the outskirts of Harlow. Just before the lock is reached the route passes under the A414, where I took advantage of the shelter of the road overhead to have a short break. On the opposite bank of the river is an outdoor centre where a large building had been built besides the river bank since I had last walked by, completely changing the appearance of the area. 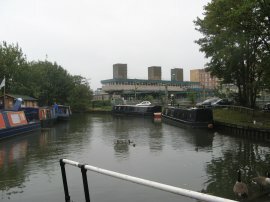 The route crosses over the river at Burnt Mill Lock and then passes Harlow Town Station, photo 7. The path then continues along a broad track running through a section of parkland besides the river bank before crossing a bridge back over to the opposite bank of the river. Continuing upstream the route passes Latton Lock, photo 8, at which point it had finally stopped raining. From Latton Lock the Harcamlow Way continues upstream, the trees on the other bank of the river doing an effective job of hiding the nearby industrial estates from view, photo 9. 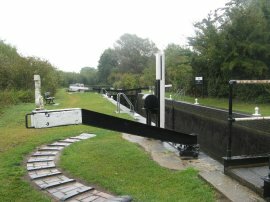 The next lock reached is Harlow Lock, where there was another piece of scuplture, The Flowing River, photo 10, placed besides the lock. From the lock it was just a few yards up to the A1184. Heading across the road the route of the Harcamlow Way, which is not way marked at all, continues along the left hand bank of the river however I crossed over to the right hand bank and continued heading upstream along the route of the more prominent river Stort navigation tow path. It was only when I stopped for a short lunch break, a good half a mile up the path, that I realised I had followed the wrong path! This was very poor navigation on my part as I had walked both paths before and should really have been paying more attention to where I was going. 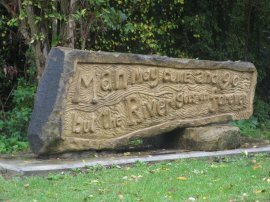 Having eaten my sandwich I then retraced my steps back to the main road and crossed over to the correct bank of the river, joining a footpath that initially runs past the front of some riverside houses. After about half a mile this path leaves the riverbank and heads over an unkempt area of ground to cross over a small stream and join a path that runs alongside a fence, heading gently uphill towards the houses of Pishiobury Drive. The route heads across the road and along an alleyway which leads out into the grounds of Pishiobury Park. 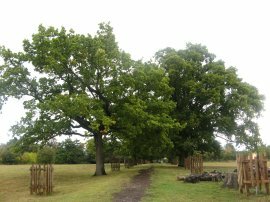 The Harcamlow Way heads gently uphill and the follows the Oak Walk, photo 11, across the grounds of the park to reach the outskirts of Sawbridgeworth. At the end of the park the route turns to the right, joining a footpath that runs downhill between houses and the park. Reaching a crossing path the route turns to the left, still running along the back of houses, to join Spring Hall Lane. The lane is followed round to the left where the route heads to the right, going uphill along Vantorts Road before turning to the right along Fairway. This suburban road is followed downhill to join Sheering Mill Lane where the route turns to the right, heading back down to cross over the River Stort by Sheering Mill Lock, photo 12. From the lock I continued up the road to Sheering Lower Road where the route turns left, before crossing over the road to join a footpath that leaves the houses, heading out between fields towards Quickbury Farm, photo 13. 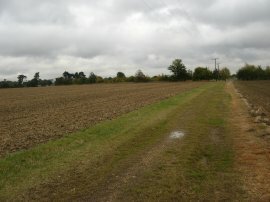 After heading between the industrial units at the farm the route joins another footpath, photo 14, that heads over fields towards the M11. Just before the motorway way is reached the Harcamlow Way joins a footpath that heads over the field on the left which is where I finished this stage of the walk. 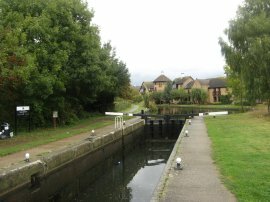 Excluding my diversion along the wrong bank of the River Stort at Harlow Mill, I had walked 8.4 miles along the Harcamlow Way. Unlike the path between the fields the next stretch of footpath is across a recently ploughed field and I hope the weather will be a bit drier when I return for stage two otherwise I will be getting very muddy boots. From my finish point I then headed along a footpath that runs to the right alongside the edge of the motorway before turning to the right to follow the field edge along a path that heads back down to Sheering Lower Road from where I retraced my steps back to the canal. Here I rejoined the towpath for the short walk up to Station Road and the car having walked a total of 11.7 miles for the day. I was pleased that I had made the effort to go out walking on such a wet day and also glad to have started a new challenge.